Cultural Compulsive Disorder: My Bad Ya'll... I'm Sorry!!!! My Bad Ya'll... 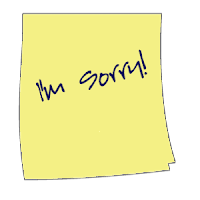 I'm Sorry!!!! Hey gang. This goes out to all my everyday CCD readers and people who subscribe to the blog, or basically anybody who checks in over here to see what we are up to. The last few weeks have been a bit hectic for me. Hectic, but in a good way. The reason I have been off CCD and not publishing my normal 4-5 posts A DAY is because I have just became the latest paid columnist for Director's Live, a brand new movie news site. This means I am actually getting paid to blog!!! While this is cool, it also came with a whole new interface. I spent all of last week trying to master it, and now I got it down. This lead to me neglecting CCD last week, and I only post one day. I am sorry. This will not happen again. Now that I got the new website ins & outs down, I should be able to balance both out. So enjoy your posts today (below) & check out my new blog posts for Director's Live by clicking here. Please become a follower and share it with your friends. Thank you... and thanks for making CCD the coolest site on the planet!! !